Sandwiched between the brightly colored cover are 70 thin, wispy, newspaper-like pages, mostly in black and white. Splashes of color here and there highlight advertisements and featured articles. The accents, carefully placed, almost appear to be embellished by hand with colored pencils. The vibrant reds, yellows, and hues of green intermittently highlighting the black-and-white pages are illustrative of the periodical’s opposing messages throughout its pages. 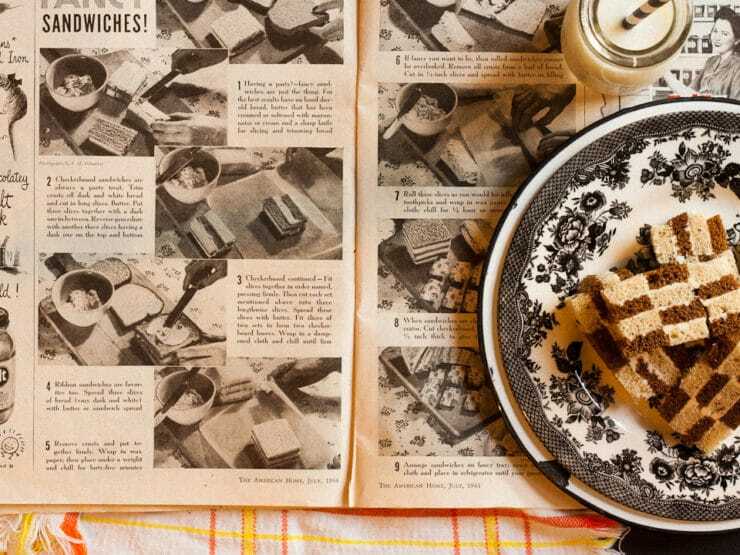 There is an underlying conflict throughout the basic layout that strategically calls attention to simplicity, reminding the readers of the seriousness of war rationing, cutting expenses, and eliminating waste. 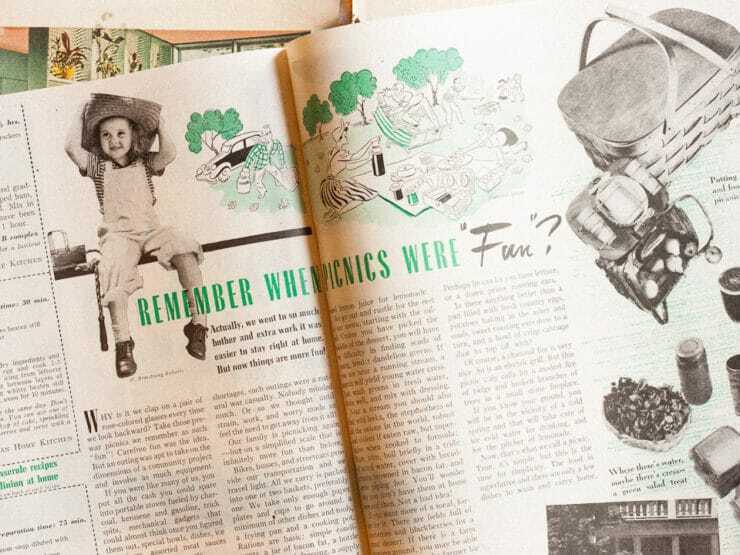 There are “how-to” instructions on planting your own “VICTORY garden” for fresh fruit and vegetables and even advertisements on home canning. 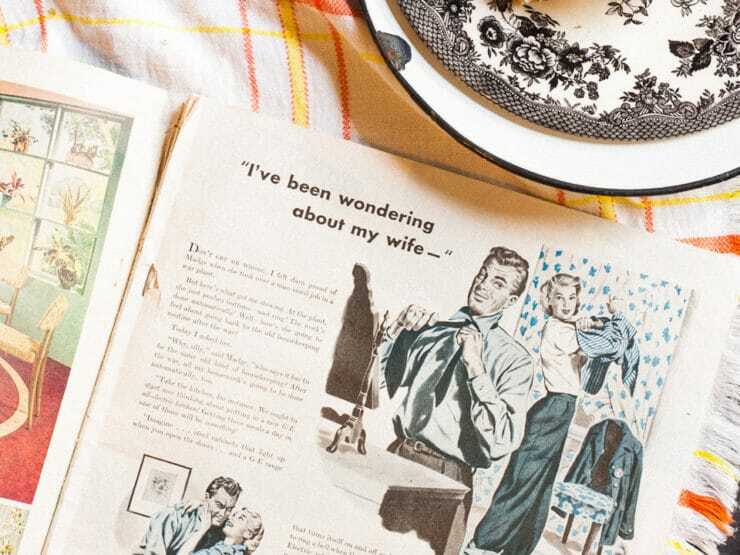 Contrary to the simplicity found in the war rationing lifestyle pages are vibrant and colorful advertisements for shiny new appliances and state of the art technology, beckoning American readers to get with the times. The colors splashed across the pages appeal to their desire for a more colorful life and give them hope for a brighter future. 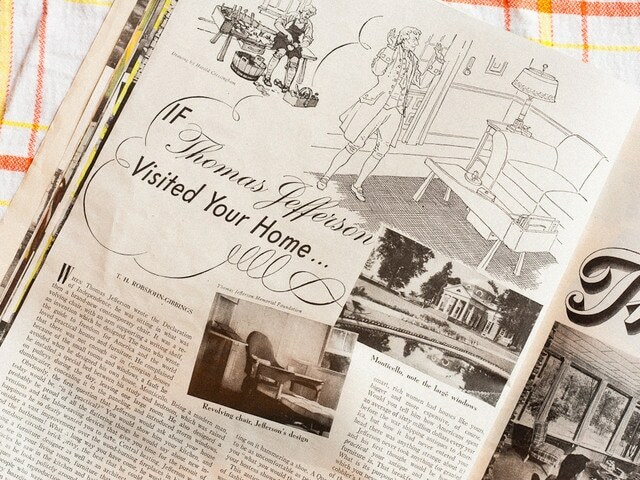 A two page spread highlights the “American Hostess” and her treasured collection of fine china and antique collectibles, while another asks the question “What if Thomas Jefferson visited your home…” This article attempts to persuade Americans to make Thomas Jefferson proud, stop collecting antiques from his era and live a more simplistic life. Again, two vastly different schools of thought existing side-by-side in the same periodical. I used dark and light rye bread with creamed butter sprinkled with a little dill. 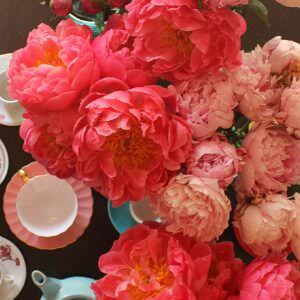 Cut delicately, they are dainty and a perfect tea sandwich. 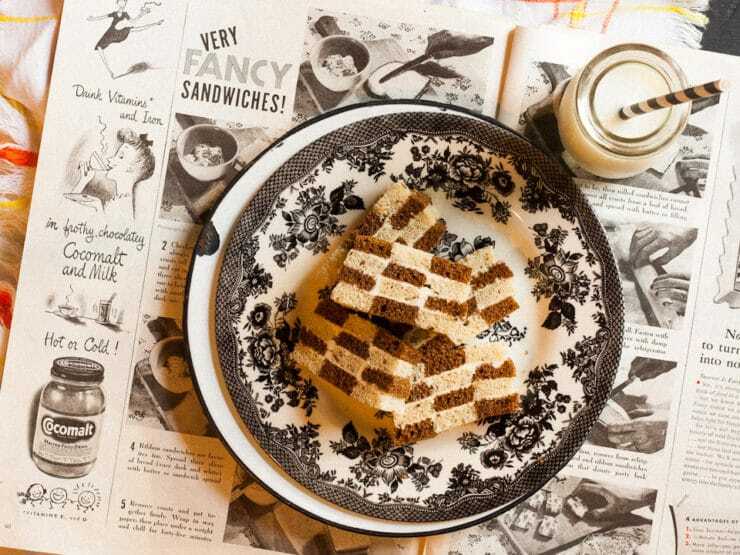 You could easily make this patterned sandwich using a creamy egg salad or dill cream cheese with thinly sliced cucumber. Just make sure your filling is a little creamy (this will be your glue) and refrigerate long enough for the sandwich slices to bond together. I’ve outlined the method below. 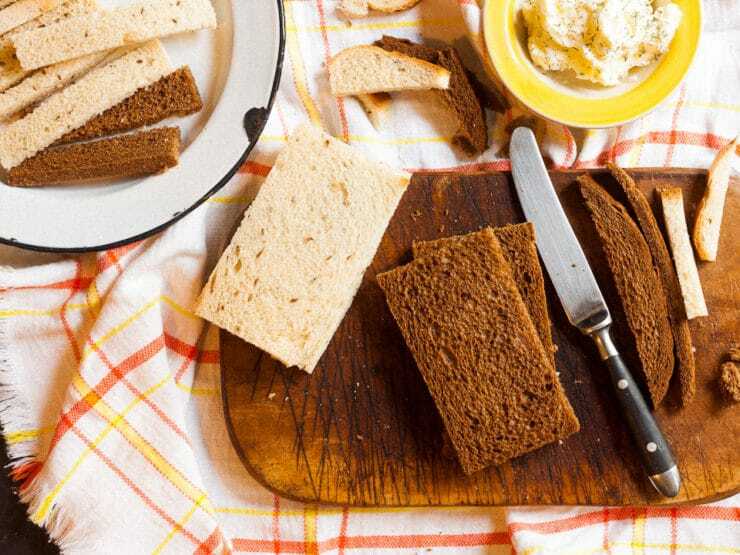 For best results have on hand day old bread, butter that has been creamed or softened with mayonnaise, dill, and a sharp knife for slicing and trimming bread. 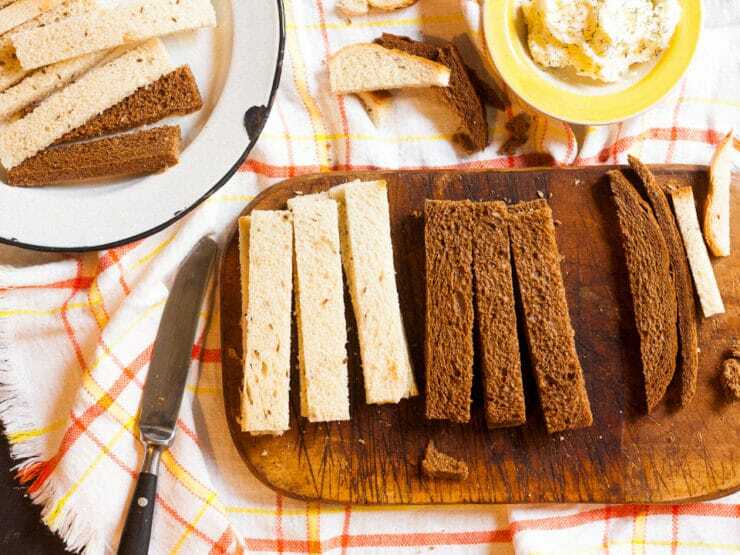 Trim crust off dark and white bread and cut in long slices. Put three slices of bread together with two light slices and a dark slice in between. Reverse procedure with another three slices, this time with dark slices on the the top and bottom and a light one in between. Butter the layered slices on one side. Fit the slices together in the order named, pressing firmly. Spread these slices with butter. Fit slices of two sets to form two checkerboard loaves. Wrap in a dampened cloth and chill until firm. When sandwiches are chilled firm, remove from refrigerator. 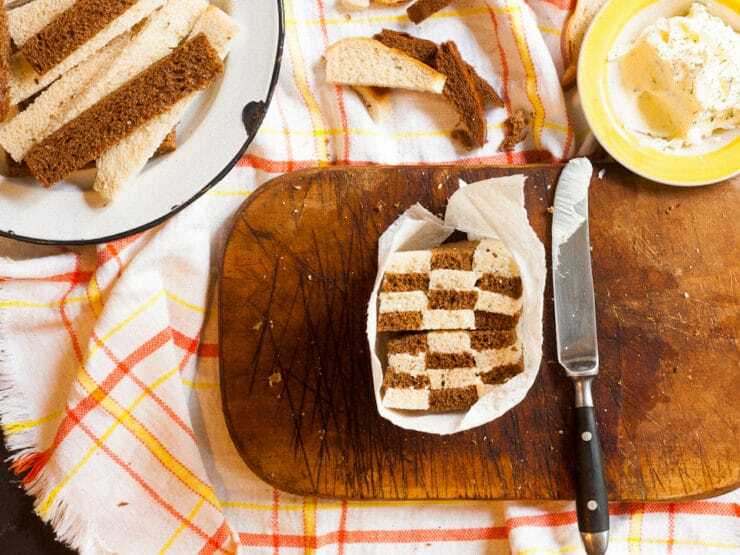 Cut checkerboard sandwiches 1/4" - 1/2" thick to give them a dainty party look. 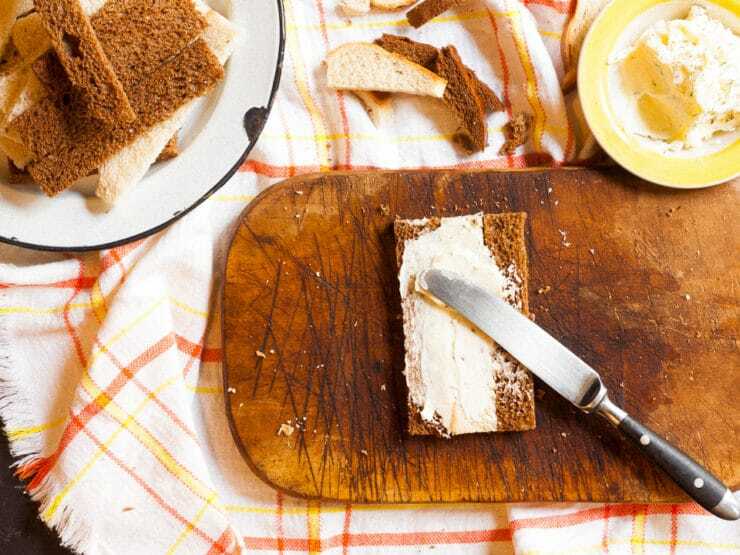 Arrange sandwiches on a fancy tray; cover with a damp cloth and place in refrigerator until your guests arrive. My granddaughter loves “going to tea” as I started her at a very young age with a non breakable tea set and we would make little sandwiches together. She is now 5 years old (I know I said at a very young age…started at about age 3). 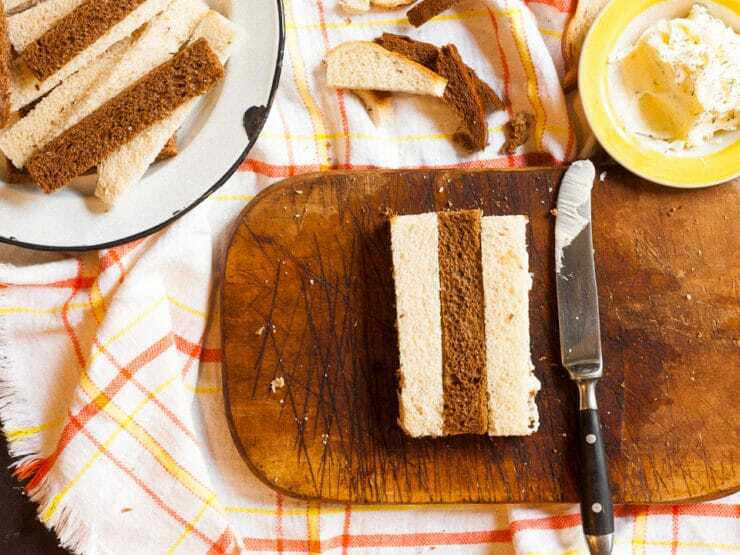 I will add this sandwich to our repertoire of tea sandwiches. Thanks! these images are awesome but you really took the hard way into making them. The easiest way is to order bread on the top. 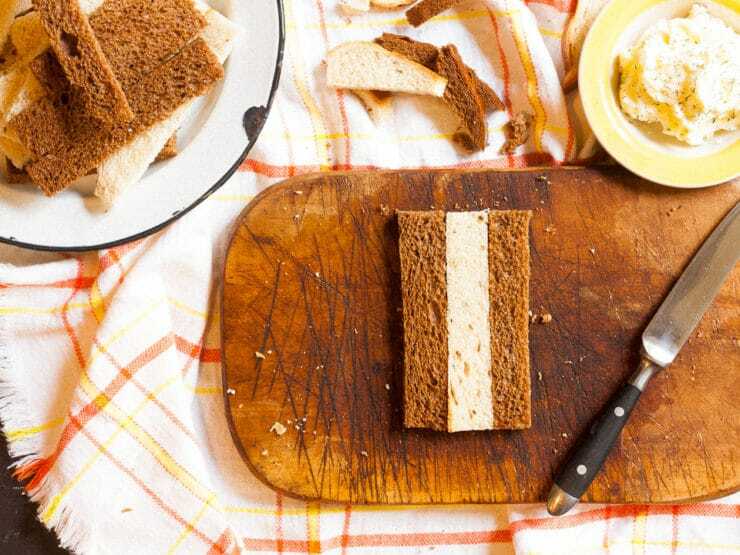 Then, better your sandwich bread but don’t cut into slices yet. do the same to 3 other slices – make sure you have 2 of each color -white and who,e wheat work fine. 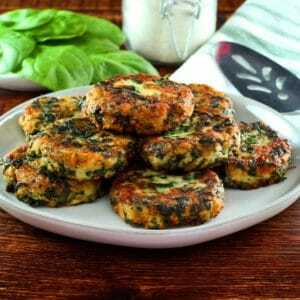 No, I add assembly – the easiest cream cheese and cheese too. Basically spent on the layer of bread; piece of bread we can talk. Until used all four pieces of bread. Do not put any filling on top. I made these in home ec. in high school in the early 60’s with specially ordered colored green and pink bread. I forgot the method and hunted everywhere….Thank-you!! These are going to my future daughter-in-law’s Alice in Wonderland bridal shower this weekend! 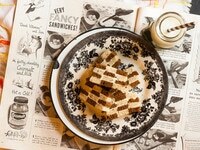 Perfect tea party nibbles! enjoyed the history! what great finger sandwiches! Ohhh yeah! I remember these!! I’ve been stymied by the advertisements for products in which a military person appears in uniform, playing with his child and he’s been gone for at least 2 years–maybe 4. How did that baby get there? Love those old magazines–they give us the perspective of “you are there” in history. I have a sandwich section of Good Housekeeping from the early 1950s that is written for high school girls. It appears to be a similar publication and is about 20 pages. 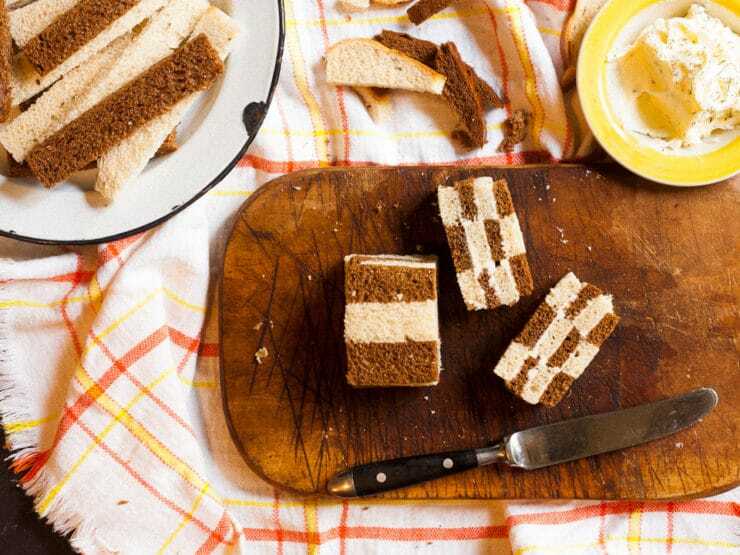 A 4 layered sandich loaf frosted with cream cheese and decorated with vegetables is what “Susan” made for her “gang” to enjoy. How times change! I get your weekly recipe on e-mail. trying to learn how to Friend you on Facebook, so I can see more postings. 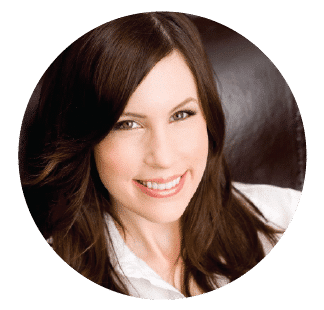 Hi Jan, search Facebook for “Tori Avey” and click “Like” on my page. To ensure you get updates in your News Feed, after you click the “Like” button, hover over the button and make sure there´s a check mark next to Get Notifications, Show in News Feed, and Add to Interest Lists. This will ensure that you won´t miss a post! These are so cute! I enjoyed reading about the magazine too. My sister collects antique magazines so I will share this with her. 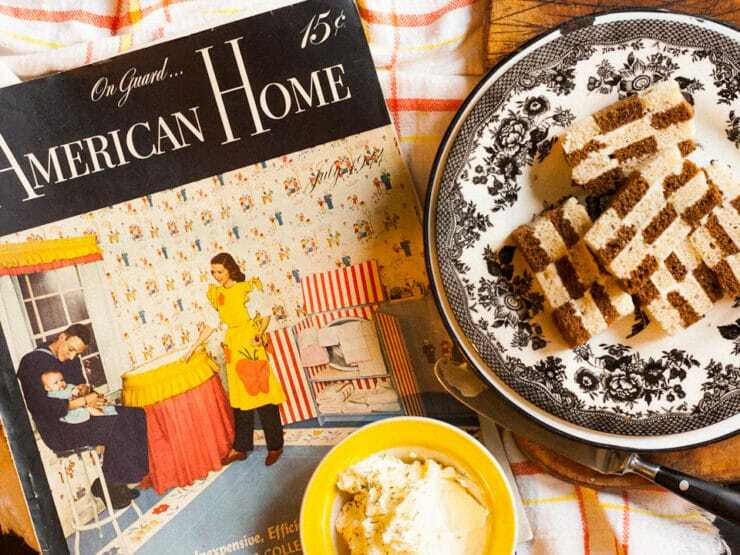 I really love this photo, I bought that vintage kitchen towel the same day I found the magazine at the Long Beach Flea Market. Such a neat find, I wish I could share each page. Great, let us know how they turn out!